Brain Box Television - Institute for Thought, Inc. Politics, performance, and documentary from around the world. Brain Box TV is a production of the Institute for Thought, made entirely by volunteers. It makes a point. Each skit, besides being funny, has something to say. We wanted to get people thinking about, and laughing about, the important social issues of oday. We are seen every Friday at 10pm and every Saturday at 11pm on MCM, Milwaukee Community Media, Cable Channel 96 in Milwaukee. The show is a mix of cutting-edge political skits, performances from top poets and musicians, interviews with influential people around the world, and documentary segments from places like Prague, Cannes, Barcelona, London, Paris, and the Burning Man Festival. We inform our viewers about different cultures, ideas, and perspectives from around the world. In a media world increasingly dominated by a few large corporate voices, we are one of the few alternatives on TV. We bring you information you can’t get anywhere else. 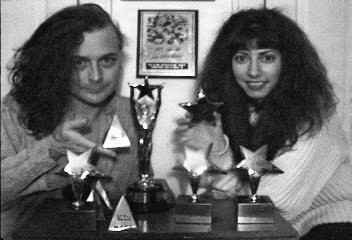 National Finalists in Entertainment Series, Entertainment Single Program, and Making a Difference categories in 1997.
awards conferred by the Milwaukee Access Telecommunications Authority. Burning Man Festival, Gerlach, Nevada, 2002, 2001, 2000, 1999, 1998, 1997. World’s largest festival of experimental arts and culture. Roy Mack Tour, Route 66 from Chicago to LA, 2002. Roy Mack is UK Entertainer of the Year 1996. Computers in Art and Design Education (CADE) conference, Glasgow, 2001. MIPTV international television conference, Cannes, 2001. Belgian International Festival of Fantasy Films, Brussels, 2001. Disseny Primavera, Barcelona, Spain, 1999. Accredited to document “Futur Compost”, an exhibition of advanced design ideas. Venice, Italy, 1999. Commentary during the peak of the Kosovo bombing campaign. Europe 1998: Nine-Country European Busking Tour, 1998. World Neo-Humanist Convention, Willow Creek, Missouri, 1996. Eric G. has been a multi-media producer and performer for over 10 years. Beginning as a sound engineer, he fronted the band ‘Nervis Virgins’ for four years, spent seven years in the ‘Joy Farm’ video troupe as actor, writer and segment producer before founding Brain Box TV in 1996. He has written and appeared in over 60 original teleplays and has performed his poetry and music in dozens of venues including a busking tour of Europe. He is currently a Simulation Engineer in the medical field with a background in research and development, analytic philosophy and engineering consulting. Russian Wulfgar has been involved with video since 1989 when she first joined the cast of “Joy Farm,” an access-TV comedy troupe. After that she joined the cast of a soap opera, “True To Desire.” This then led to her joining with “Brain Box,” where she has remained since 1996. Wulfgar is involved in the Milwaukee Film Corps and helped produce their First and second Annual Film Festival. Wulfgar is self-employed as a Digital Archivist and Transcriptionist. She is also a Temple of Poi Certified Instructor and HoopGirl Certified Instructor since 2008.